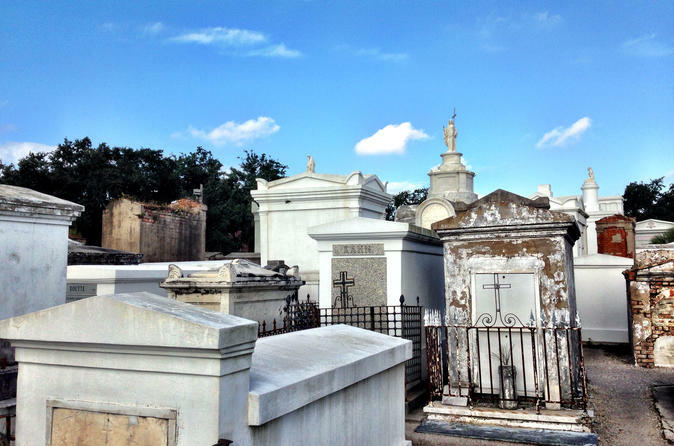 Explore one of the most famous cemeteries in New Orleans with this 1-hour tour of the St. Louis Cemetery No. 1. See the grave of Marie Laveaux, the voodoo queen, and some filming locations of 'Easy Rider.' Learn about wall vaults, family tombs, and society tombs. This sacred space requires reverence and it's with specific permission from the Archdiocese that only guests with licensed guides are admitted. Meet your guide outside a local cafe located 1 block from the cemetery. There you'll be able to wait in comfort and obtain a pre-tour snack. Food and beverage aren't allowed in cemetery, so please allow enough time to finish. Your guide will provide some general area history as you make your way to the gates of the cemetery. St. Louis Cemetery No. 1, the oldest extant cemetery in the city, is a sacred space as well as a popular site for visitors. While photographs are allowed, no videotaping is permitted. Catholicism is an integral part of the conversation. Several faiths reveal themselves as an element of the cemetery's history. Multiple cultures are celebrated and remembered as we linger. Wall vaults, family tombs, society tombs, building materials, and funeral dirges are discussed. This tour is designed to provide an experience for those seeking a small group experience of St. Louis No. 1 with a warm, professional guide. How the dead are treated says a lot about who we are as a people, making this an interesting exploration of New Orleans culture.